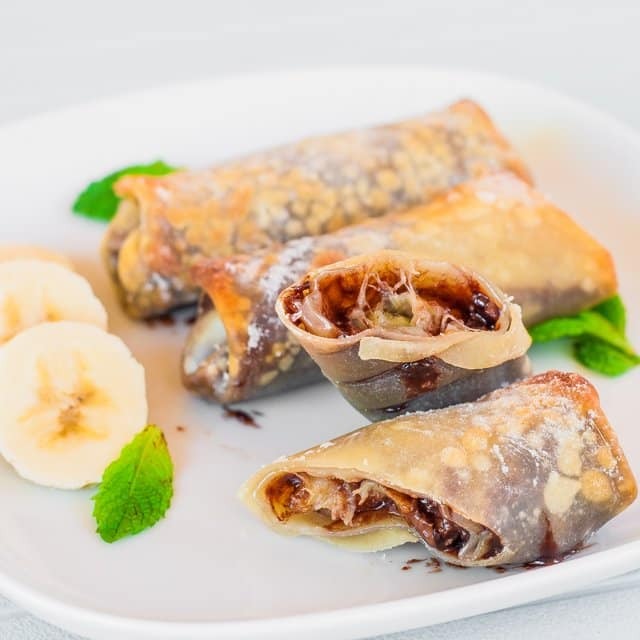 Banana and Nutella Rolls – need I say more? These are truly for the Nutella fans! Simple to make, healthy because they’re baked, it’s yum in your tum! It’s the weekend again and to top it off it’s a long weekend so I’m extremely happy. I love long weekends. It’s time for cocktails, barbecue and awesome desserts. While I was enjoying my mojito out on the deck, an idea came to me! Nutella and banana in an egg roll wrapper! Earlier this summer I did nutella and strawberries in wonton wrappers and they were just awesome and a success. It is time for something different though. So I always knew bananas and nutella were a great marriage so putting them together in a wrapper is just the next logical step. Well this time I made these babies “healthier” by baking the rolls and trust me baking them didn’t make them lose any flavor at all. They were just as delicious as though they were fried, without the guilt. I only made 6 rolls, but let me say I barely got a chance to take pictures and they were gone. Yummy! I don’t think I need to describe how good they are, if you’re a nutella fan as I am, you know how good anything with nutella is. I’m still thinking of someday mixing nutella and bacon together, but for now bananas and nutella it is! Nutella is my favorite too! I’ll be anxiously awaiting the bacon-Nutella creation!!! Oh great. That would be nicely serve if bits of jackfruit are inside the wrapped banana. I love it. Woww, these look so dreamy. I would love to eat them all! !